The four most used dip oilers by watchmakers. 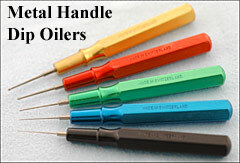 Just dip the fine needle like tip into oil and a very small drop of oil will stay on the oilers tip. Now just place the oilers tip on the spot where you want that drop of oil to go and it will be transfer from the oilers fine needle like tip to the spot you picked to touch the oilers tip to. Standard Plastic Handles, Swiss Made. The complete set of watchmakers oilers, from super fine to ex-large. Standard Plastic Handle, Swiss Made. 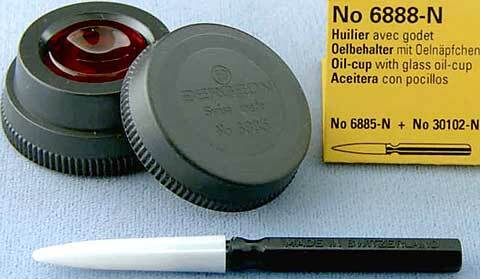 Black is the most used size dip oiler used by watchmakers. Bergeon, claims that their black oiler is the same size as their red oiler. It seems that black is the color American associate the smallest tip size and the Red is the color that European Watchmakers associate with the smallest tip. With have both the Red and Black Handle Bergeon Dip Oilers. The weight of the Black oiler is about 1.24 grams each. For those who like the added weight of metal handles. 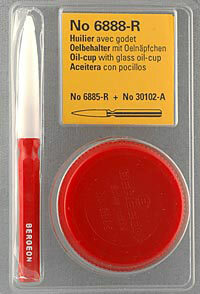 This Bergeon ultra-fine oiler is usually used to put oil through the hole jewel and on to the cap jewel. Two spare tips are supplied in the handle. Replacement tip for the Ultra-Fine Oiler. This is the finest oil cup stand on the market and is a must have item for any watchmaker. Only a little bit of oil should be placed in each of the agate cups at a time. Oil should be transferred to the cups by large drops from a large oiler or a clean nail. In the center of the stand is pith wood cup for cleaning the oilers. 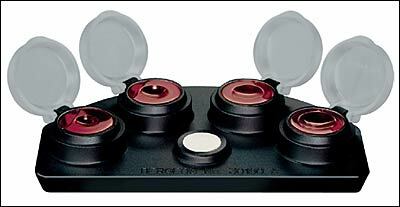 Comes with 4 ruby cups (6 mm, 8 mm, 9 mm, and 10 mm wells). This is the finest oil cup stand on the market and is a must have item for any watchmaker. Only a little bit of oil should be placed in each of the agate cups at a time. Oil should be transferred to the cups by large drops from a large oiler or a clean nail. In the center of the stand is pith wood cup for cleaning the oilers. The white ceramic cup makes it easier to see the oil. Comes with 3 white ceramic cups (8 mm, 9 mm, and 10 mm wells) and 1 black ceramic cup (10 mm well). This is the finest oil cup stand on the market and is a must have item for any watchmaker. Only a little bit of oil should be placed in each of the agate cups at a time. Oil should be transferred to the cups by large drops from a large oiler or a clean nail. In the center of the stand is pith wood cup for cleaning the oilers. The white ceramic cup makes it easier to see the oil. Comes with 4 white ceramic cups (6 mm, 8 mm, 9 mm, and 10 mm wells). 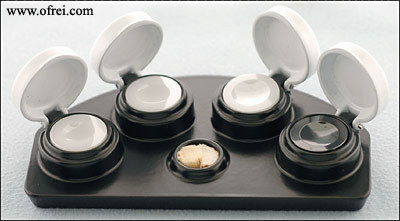 Comes with 3 white ceramic cups (8mm, 9mm, and 10mm wells) and 1 black ceramic cup (10mm well). Only a little bit of oil should be placed in each of the agate cups at a time. Oil should be transferred to the cups by large drops from a large oiler or a clean nail. In the center of the stand is pith wood cup for cleaning the oilers. The white ceramic cup makes it easier to see oil and black ceramic cup is great for grease. The Bergeon 7718-1A Automatic Oiler now REPLACES The Bergeon 2718-1A Automatic Oiler (No Longer Available). The 1A oiler is the most used of all the automatic oilers. For oiling shock protection devices in watches and for balance bearings of all kinds without removing the cap jewel. Comes with plastic oiler stand. Contents: 100 mm3. Example: Incabloc, Kif, setting-jewels, etc. Replace a worn or damaged needle with a new needle for the new version Bergeon Automatic Oiler 7718-1A. Can also be used with the older version 2718-1A Oiler. This is the plastic reservoir complete with the steel tube tip at one end for the new version Bergeon Automatic Oiler 7718-1A and 7720-5. Can be used with older version 2718-1A and 2720-5 Oilers. The Bergeon 7719-2A Automatic Oiler now REPLACES The Bergeon 2719-2A Automatic Oiler (No Longer Available). This oiler is designed to be used like a standard oiler (FB-903). The trigger is released, the drop of oil appears at the tip, and the oil is applied to the part. This can be convenient, but it often means adjusting and checking the flow for different applications. I would use the standard oiler (FB-904) instead. 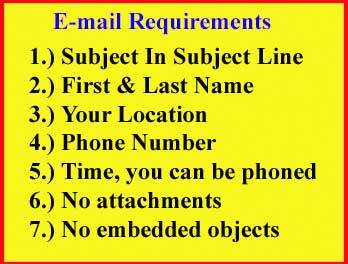 I do use the No. 2A for applying PML grease to keyless works parts, as it's a convenience and provides good control. Comes with plastic oiler stand. 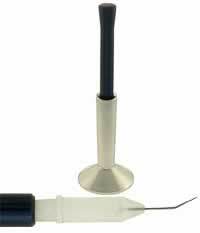 Replace a worn or damaged needle with a new needle for the new version Bergeon Automatic Oiler 7719-2A. Can also be used with the older version 2719-2A oiler. This is the plastic reservoir complete with the steel tube tip at one end for the new version Bergeon Automatic Oiler 7719-2A. Can also be used with the older version 2719-2A oiler. The Bergeon 7720-5 Automatic Oiler now REPLACES The Bergeon 2720-5 Automatic Oiler (No Longer Available). The number 5 is a drop injection style oiler. Use for train wheel pivots, cup bearings, everywhere that the oiler needs to be positioned before depositing oil. Range of application: Everywhere a carefully and precise quantity of oil has to be deposited. Easy use. 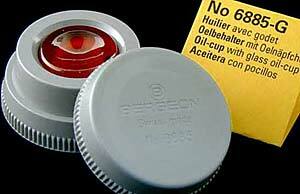 Inside the oiler, oil is protected against dust. Comes with plastic oiler stand. 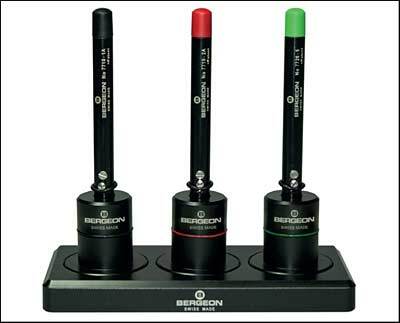 Replace a worn or damaged needle with a new needle for new version Bergeon Automatic Oiler 7720-5. Can also be used with the older version 2720-5 oiler. Set comes with Automatic Oilers 1A, 2A, 5, and base. This is the steel tube at the end of the reservoir, this is the part the needle goes thru. The Bergeon Automatic Oiler 2720-5 also uses this same part BERG-2718-D if you need a replacement steel tube for your number 5 oiler order this one. This is the plastic reservoir complete with the steel tube tip at one end. For the escapement. For ligne sizes 11 - +. The exterior diameter of the needle is 0.43 mm. 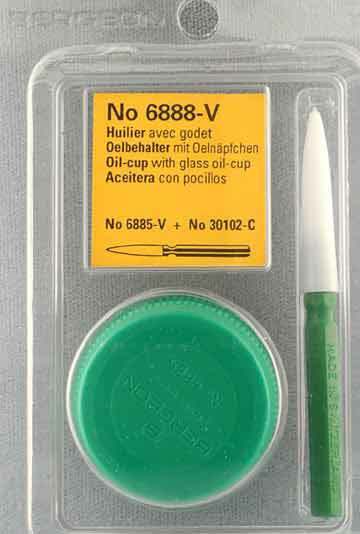 On your receipt of JISMAA oiler, before use, remove the little steel wire you will find from the tube to the needle tip. When it is time to clean the tube/reservoir only rectified benzine is recommended by JISMAA of Switzerland. The reservoir can be filled to its collar, which is at 2/3 of it height. 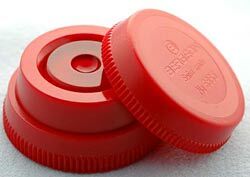 The little white stopper with center hole acts as a regulator and needs to be cleaned of any trace of oil and put back in place after every filling. 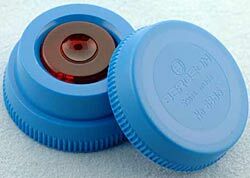 New from Bergeon coloured synthetic-material oil-cup, diameter 34 mm and stackable. Green color has 10 mm well of ruby tinted color glass. Save money by getting the set of 3. Comes with stackable oil-cup in red, green, and blue. Yellow color has 12 mm diameter well. Black color has 12 mm diameter well. Gray color has 12 mm diameter well. 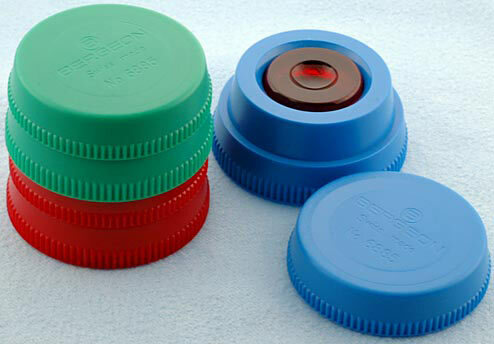 New from Bergeon coloured synthetic-material oil-cup, diameter 34 mm and stackable. Red color has 6 mm well of ruby tinted color glass. Package with a matching color Bergeon Swiss made dip oiler. 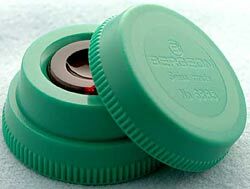 New from Bergeon coloured synthetic-material oil-cup, diameter 34 mm and stackable. Blue color has 8 mm well of ruby tinted color glass. Package with a matching color Bergeon Swiss made dip oiler. New from Bergeon coloured synthetic-material oil-cup, diameter 34 mm and stackable. Green color has 10 mm well of ruby tinted color glass. Package with a matching color Bergeon Swiss made dip oiler. 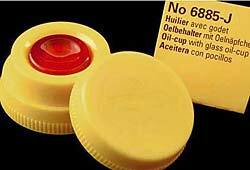 New from Bergeon coloured synthetic-material oil-cup, diameter 34 mm and stackable. Yellow color has 12 mm well of ruby tinted color glass. Package with a matching color Bergeon Swiss made dip oiler. Similar to the Bergeon 4722 pocket oiler, but the Horotec precision oiler has the oil already equipped inside of the pen. There will be no oil wasted. The surplus of oil will automatically return back in the tank when the job is done. See thru handle for visible oil level. Hand diameter at 0.90 mm. Length at 153 mm. Swiss Made Single Tube multi-functional oil refill for both the Bergeon (BERG-4722) and Horotec (MSA 17.210) Precision Pocket Oilers. Takes two tube for a full refill. 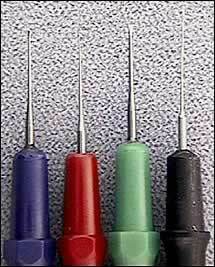 High precision stainless steel needles, electropolished. Ergonomic handle with colored rings for identification and excellent grip. Specially adapted for all precision oiling. 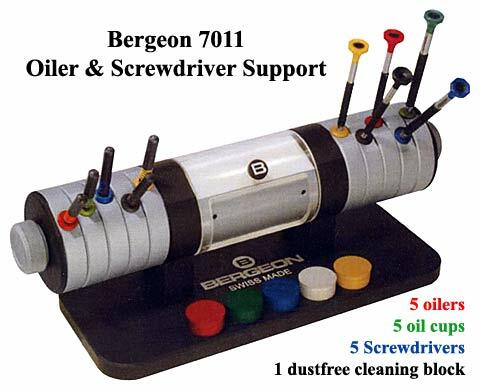 Characteristics for the Bergeon 7013-4 includes synthetic handle, antistatic; very good hold of the drop; repeatability of the oil's quantity; precision of the drop's deposit, and possibility of half drop's deposit. An exceptional design combining technology, creativity and ergonomy for this new oil and clean panoramic base. This highly functional and original product has been manufactured exclusively from cutting edge strategic materials. Each individual holder on the support rotates to your ideal position. Those who appreciate beautiful objects will be more than delighted. 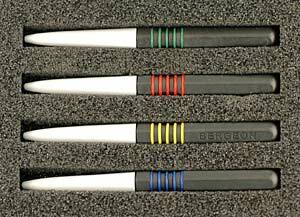 5 luxury oilers: black 7013-N (0.18 mm diameter), red 7013-R (0.18 mm), blue 7013-B (0.24 mm), green 7013-V (0.32 mm), and yellow 7013-J (0.45 mm). High precision needles in stainless steel, electropolished. Ergonomic handle with coloured rings for identification and perfect grip. 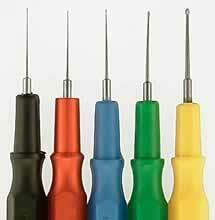 5 stainless steel screwdrivers with elastomere membrane: yellow 6899-080 (0.80 mm), black 6899-100 (1.00 mm), red 6899-120 (1.20 mm), green 6899-200 (2.00 mm), and blue 6899-250 (2.50 mm). 5 anodized aluminium oil cups with polished receptacles. 1 spongious block: this foam block is dust free and very absorbent, specially adapted for the hard cleaning of oilers and other precision tools. The Cube cabinet is made of solid aluminum measuring 150 x 150 x 150 mm. There are various models with a combination of different draws. This model comes with 6 extremely compact drawers with 3 draws containing nine plastic compartment slots and 3 draws with three plastic compartment trays. 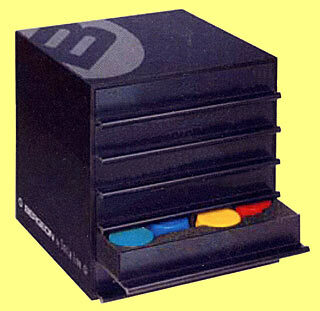 It is built to organize small tools and other instruments used daily by watchmakers or micro-technicians. With the 7014-N-V2 Cube cabinet on your bench top, you dont have to waste time searching for that small parts or tool. Attractive design that keeps you organize! 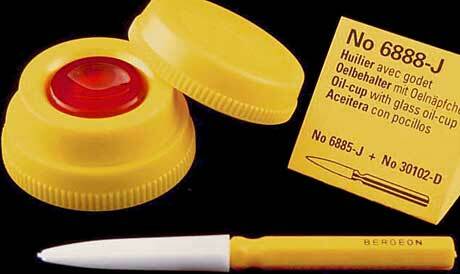 The inexpensive pocket oiler is portable and can carried around like a pen. Just squeeze the base for the right amount of lightweight oil with rust inhibitors. The oil is this pen is different than all the watch and clock oils on the page. It is lightweight oil with rust inhibitors that really would not be use on watches, however it does a job for those working on gauges and clocks while preforming basic maintenance in the field without taking the unit apart to oil every hard to reach spot. Can be used with the optional plastic spout extension, OIL358.99, to get into those really hard to reach places by adding an addition 8 inches in length to the pen oiler. 8" plastic spout extension to be used on the inexpensive pocket oiler for those hard to reach places. Individual Bergeon Agate Red Ruby 6mm Oil Cup. 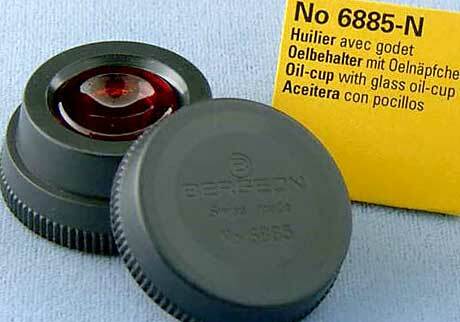 Replacement oil cup for the Bergeon 30180-A Die Cast Alloy Four-Cup Metal Oil Stand. The first oil cup from the left. Individual Bergeon Agate Red Ruby 8mm Oil Cup. Replacement oil cup for the Bergeon 30180-A Die Cast Alloy Four-Cup Metal Oil Stand. The second oil cup from the left. Individual Bergeon Agate Red Ruby 9mm Oil Cup. Replacement oil cup for the Bergeon 30180-A Die Cast Alloy Four-Cup Metal Oil Stand. The third oil cup from the left. Individual Bergeon Agate Red Ruby 10mm Oil Cup. Replacement oil cup for the Bergeon 30180-A Die Cast Alloy Four-Cup Metal Oil Stand. The fourth oil cup from the left. 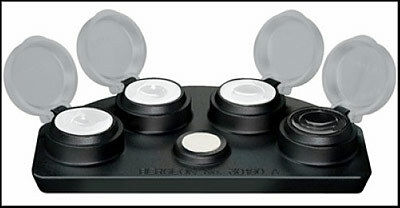 Individual Bergeon black ceramic 10mm oil cup. The contrasting color makes it easier to see the grease being used. 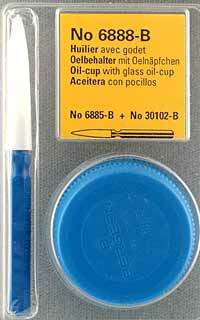 Replacement oil cup for the Bergeon 30180-A Die Cast Alloy Four-Cup Metal Oil Stand. The fourth oil cup from the left.